REN Micro Polish Cleanser 150ml is a 2-in-1 facial cleanser and exfoliator, that deeply cleanses while it gently exfoliates to leave skin looking and feeling refreshed, purified and radiant. 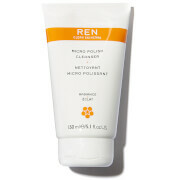 Formulated with amber powder micro-beads that slough off dead skin cells in a gently foaming mousse, REN Micro Polish Cleanser removes dirt and debris and ‘polishes’ the skin to increase circulation and glow, without harshness. The appearance of pore size and fine lines will be reduced and your skin will appear brighter, radiant, and more energised. A selection of fruit acids also help to exfoliate and decongest to reveal a brighter looking complexion, including Glycolic Acids from Pineapple, Lactic Acid from Passion Fruit, plus Papaya Extract, which helps to retain moisture. REN Clean Skincare Face Radiance Micro Polish Cleanser 150ml / 5.1 fl.oz. 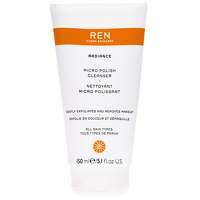 REN Micro Polish Cleanser 150ml was found on 6 websites and was price compared using EAN: 5060033775134. The cheapest REN Micro Polish Cleanser 150ml is shown as the main item, prices range from £14.40 to £23.00, excluding delivery. Price comparison based on price and delivery charges, with any valid discount codes being applied, is shown in the table above. Prices and information correct at the time of publication.